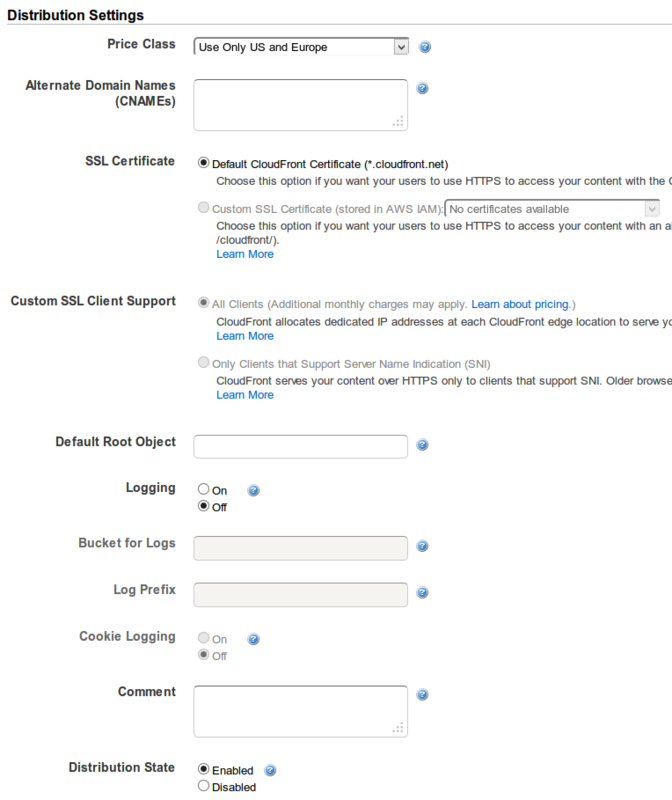 "AWS": "arn:aws:iam::cloudfront:user/CloudFront Origin Access Identity *********"
Sign in to the AWS Management Console and open the Amazon CloudFront console at https://console.aws.amazon.com/cloudfront/. In the list of distributions in the top pane, select the distribution to update. In the Distribution Details pane, on the General tab, click Edit. In the Edit Distribution dialog box, in the Default Root Object field, enter the file name of the default root object. Enter only the object name, for example, index.html. Do not add a / before the object name. To save your changes, click Yes, Edit. Partially it's Amazon's fault as well, because when you set up CloudFront distribution, it will offer you S3 buckets to choose from, but if you do choose one of those it will use the bucket URL rather than static website hosting URL as a backend. I had the same issue as @Cezz, though the solution would not work in my case. As soon as static website hosting is enabled for the bucket, it means users can access the content either via the Cloudfront URL, or the S3 URL, which is not always desirable. For example, in my case, the Cloudfront distribution is SSL enabled, and users should not be able to access it over a non-SSL connection. What was happening was the entire CloudFront GET request gets sent to the origin: /image/my-image.jpg prefixed by Origin Path: /images, so the request into S3 looks like /images/images/my-image.jpg which doesn't exist. This allowed me to access the bucket with an origin access identity and bucket permissions and individual file permissions restricted. In my case I had configured Route 53 wrongly. 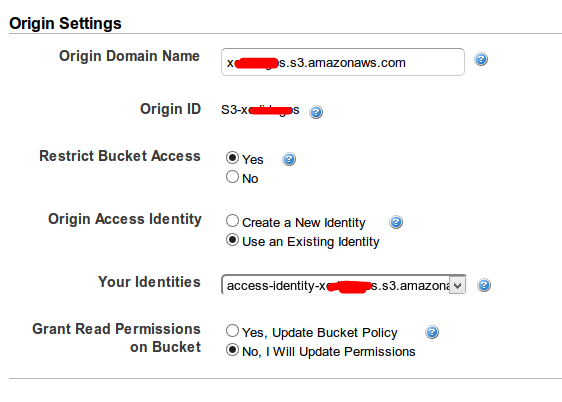 I'd created an Alias on my domain but pointed it to the S3 Bucket instead of the CloudFront distribution. Also I omitted the default root object. The console could really be improved if they add a bit of information to the question mark text about the potential consequences of omitting it. Not the answer you're looking for? Browse other questions tagged permissions amazon-web-services amazon-s3 amazon-cloudfront or ask your own question.